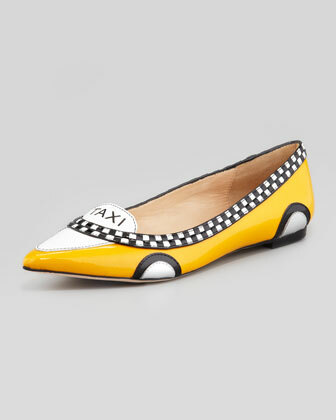 Today's So Shoe Me is the Go Taxi Pointed Toe Flat by Kate Spade New York, $278, available at Neiman Marcus. Step up your commuter style with these flat fee taxi slip-ons. The checkered monochrome accents and bright yellow body add iconic city imagery to these everyday pointed toe flats. The patent leather upper adds a luxe shine while the pointed toe is sophisticated and flattering so you can wear these revved up slip-ons to the office or on the weekend. Pair these checkered taxi shoes with a signature white leather jacket and a monochrome op-art dress for the perfect mix of prints and textures for fall. So Shoe Me a pair of commuter friendly taxi flats that will add a friendly way of everyday transportation to rev up my favorite fall pieces.